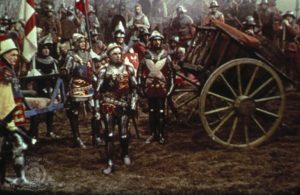 For George MacDonald Fraser, Richard Lester’s screenwriter for The Three and The Four Musketeers, and therefore our patron saint, the Olivier version of Shakespeare’s Henry V was the finest movie ever made. It’s a wonderful film, justly celebrated, and there are plenty of sources available explaining why it’s so admirable. For the purposes of this series, we’ll confine ourselves to just two aspects of this classic. First, the armor: ever since Mark Twain’s A Connecticut Yankee in King Arthur’s Court (1889) had made a mockery of knights in shining armor, it had become the received wisdom that a medieval warrior in full plate was awkward, encumbered, and a lumbering clod once off his horse. Most mid-century Hollywood historical epics paid deference to this idea, showing warriors in heavy armor clanking around ponderously. But the knights and nobles of Henry V wear their plate armor lightly, as if it was tailored for them—as of course it was—seeming completely comfortable and at home while wrapped head to toe in metal, their movements unencumbered, even elegant. More recent scholarship and reconstructions inform us that was, in fact, the way of it: battle armor, though heavy, was made to move and fight in. Second, there’s the play’s sprawling set piece in the next-to-last act, the recreation of the Battle of Agincourt. In 1944 the Luftwaffe was causing problems in England and even Wales, so the battle was filmed in Ireland, the rolling fields of County Wicklow standing in for the Pas de Calais. A decisive battle in the Hundred Years’ War between France and England, at Agincourt a much larger army of French knights and men-at-arms accosted King Henry’s badly-fatigued force of footmen and English and Welsh longbowmen. To summarize: the French knights charged the English across muddy plowed fields and were slaughtered by the archers. The men-at-arms then closed in from both sides and the battle became a general mêlée, but the English never lost the upper hand, and the French were trounced. Olivier’s depiction of the battle’s opening scenes was a landmark for its time, unmatched in its clarity and power. The initial charge of the French heavy cavalry draws on Eisenstein’s charge of the Teutonic Knights in Alexander Nevsky, but goes it one better: a tracking camera follows the French vanguard from the side as the knights advance, going from a walk to a trot to a full gallop that seems unstoppable—until they hit the muddy fields and a wall of English and Welsh arrows. The battle then becomes episodic, reverting to Shakespeare’s structure of jumping back and forth to encounters between various combatants, English and French, whom we’d been introduced to earlier in the play. It all ends in a final clash between King Henry and the Constable of the French Army, with Henry, of course, victorious. Watch for Robert Newton—Long John Silver himself—hamming it up as Ancient Pistol, an English hedge-knight who’s become the leader of Prince Hal’s old band of rogues since the death of John Falstaff. He is hilarious.